Don Molino was named 2018 National Farm Broadcaster of the Year by the National Association of Farm Broadcasting. He is pictured here with his wife Laura. KANSAS CITY, MO – Don Molino has been speaking to Louisiana farmers and ranchers over the airwaves of Louisiana radio stations for over 30 years. But on Friday, the long-time farm radio broadcaster was speechless. The National Association of Farm Broadcasting recognized Molino as its 2018 National Farm Broadcaster of the Year at its annual convention in Kansas City, Missouri. It is the highest honor given by the farm broadcasting industry. Molino is the senior farm broadcaster for The Voice of Louisiana Agriculture Radio Network based in Baton Rouge. His broadcasts are heard each weekday on over 20 radio stations across the state of Louisiana. 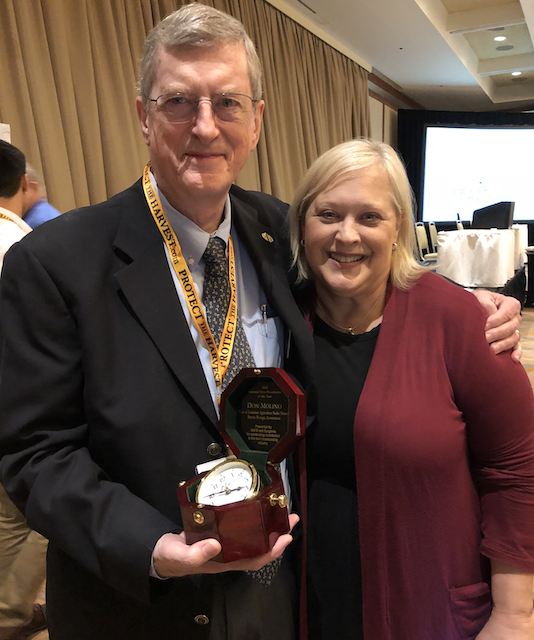 He also celebrated another milestone last year, when the Louisiana Association of Broadcasters presented Molino with the LAB Lifetime Achievement Award. Molino has spent his entire career on the radio. His first broadcasting experience began in high school on his local radio station KFTV-AM in Paris, Texas. It was the early 1960’s and Molino cultivated a love of broadcasting that has lasted a lifetime. Molino was awarded an engraved commemorative clock along with a $1,300 cash award, courtesy of Syngenta. His next step in his broadcasting journey took him to East Texas State University, where he earned a degree in Broadcast Journalism while also working for KGVL-AM in Greenville, TX. It was also during those college days that Molino got a taste of television broadcasting by landing a spot as the weekend sports anchor for WFAA-TV in Dallas. The TV job also had a radio responsibility where Molino was a news reporter for WFAA AM/FM, giving him major market experience in the Dallas - Ft. Worth Metroplex. In 1971, Uncle Sam came calling and Molino was drafted into U.S. Army in 1971. “They gave me a two-year paid vacation in the Panama Canal Zone, where I did television and radio news for one year, eight months, and eight days…but who’s counting?” said Molino. Once his obligation to the Army was complete, he refocused his sights on his broadcasting career and landed a news job at KRLD-AM in Dallas, a 50,000-watt station that is still a dominant force in radio today. A radio career can be a very mobile one, and Molino was feeling the itch to get away from home to see more of the country. In 1973, he took a position as news and farm director for the Mississippi Radio News Network. It was there that Molino got his first experience in farm broadcasting, a niche specialty of radio with a very loyal following. With no internet and very few reliable sources of information, farmers depended heavily on their local radio station for agricultural news and market information, and Molino was the source for Mississippi farmers. Molino made his final career move to Baton Rouge, Louisiana in 1980 where he has spent the last 36 years as a news and farm broadcaster for the Louisiana Radio Network and the Voice of Louisiana Agriculture Radio Network. He also had the chance to get back on television during this time, and co-hosted the syndicated 30-minute weekly television show “This Week in Louisiana Agriculture” for ten years. One look at the wall of his office will give you a glimpse into the appreciation the agricultural industry has for Molino. The plaques come from all corners of both farming and radio, ranging from the National Association of Farm Broadcasters “Southern Region Farm Broadcaster of the Year” in 1997 to the Louisiana Farm Bureau Federation’s “Ag Communicator of the Year” in 2006. Molino has interviewed an uncountable number of farmers and agricultural officials, including one of the most powerful farmers of the modern age – President Jimmy Carter, who was a peanut farmer from Georgia. That list of interviews goes on to include Louisiana governors, U.S. Secretaries of Agriculture and farmers in practically every Louisiana parish. Throughout his career, Molino has been an active member of the National Association of Farm Broadcasting (NAFB). He is a former NAFB national and regional vice-president. In 2017, Molino was honored for 30 years of service to the organization. At age 72, Molino is still going strong. His smooth and assuring voice still graces the airwaves across Louisiana each day, providing Louisiana’s farmers and ranchers with information that is vital to their success and proving that radio is still a viable source of trusted information in this digital age.